Now there is Supernatural Trivial Pursuit and that means you can test who of your friends is the true fan of Supernatural. 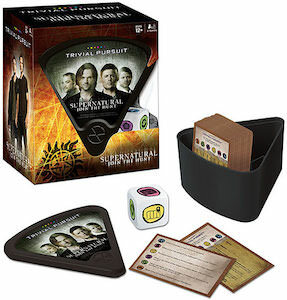 Trivial Pursuit has been the knowledge game for a long time now and now there is a Supernatural version that will test your knowledge of Sam and Dean Winchester and all the other things you may have seen in the TV series over the years. The game has 600 questions from over all the years of Supernatural and the six trivia categories are: The Winchester Brother;, Angels and Demons; Locations, Spells, Objects, and Rituals; Creatures; and Join the Hunt. So get ready to show the world your knowledge of the Supernatural world. 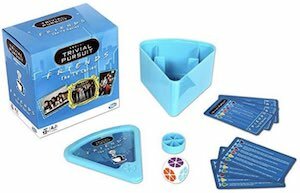 If you are a trivia nut and love the Harry Potter movies and/or books, then you will absolutely fall in love with the Harry Potter Edition of Trivial Pursuit. The box has Harry Potter and Dumbledore and other characters from the Harry Potter movies. 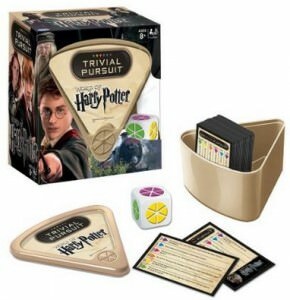 It comes with the trivia cards, a die and the pie pieces to move around and become the grand champion of Hogwarts. This edition of Trivial Pursuit features over 600 questions based on the franchise created by J.K. Rowling. There are 6 different categories of questions; Hogwarts, Magical Creatures, Magical Objects, Magical People and Animals, Magical Spells and Potions and The Dark Arts. 2 or more people can play this version and it does travel well. Test your knowledge with your friends and get the Harry Potter Trivial Pursuit.